Start every morning in your exclusive and innovative bathroom, we recommend attractive, modern and optimal Vanity Tops. After diamond Silestone is one of the hardest minerals. The quartz is added to a mix of resin and dyes. Thus it is particularly suitable for wash basins. In addition, Silestone, unlike natural stone, not subject to the structures and patterns. In bathrooms wash basins are eye-catching and, together with taps and sinks the center. You can be generous and comfortable and are characterized by their unusual proportions. 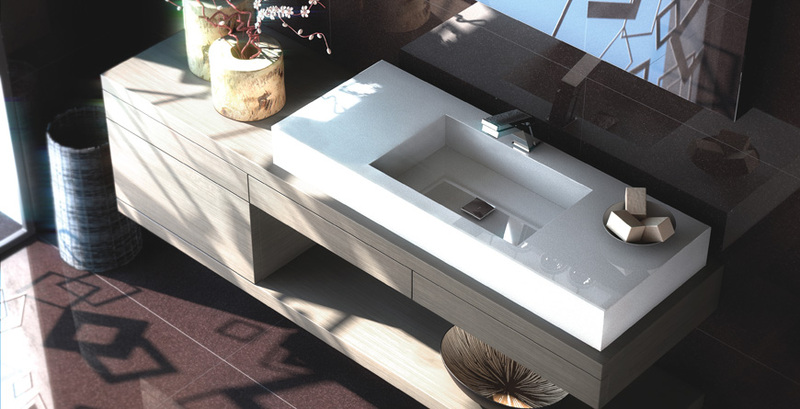 Clean lines characterize silestone vanity tops and give them personality. These vanities combine pure elegance with the highest durability. Extensive colors, interesting formats and imaginative designs from simple to elegant features of the possibilities and evaluate bathroom looks. We produce Vanity Tops in the strengths 1.2cm, 2.0cm, 3.0cm. Shape and size of the washbasin can also depend on the available space in the bathroom and your wishes. We are not satisfied with assembly solutions, but design and customize for every client the required perception, so that you can enjoy every morning in your exclusive bathroom.